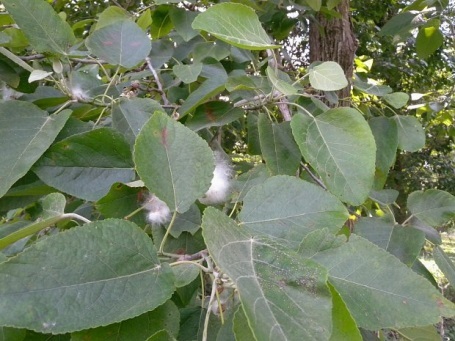 Populus grandidentata.leaves and fibers around fruit.Copyright.©.2014.Donald Cameron.New England Wild Flower Society.gobotany.newenglandwild.org (Accessed 9/2014). Populus heterophylla is a colonial tree, with many similar sized stems close together, bark deeply furrowed, gray-brown. Leaves broadly egg-shaped, large, about 18 cm long, tip blunt, base lobed, margin toothed, petiole only slightly flattened near top. Flowers sexes on separate individuals (dioecious) catkins. Fruits dry, oval, about 1 cm long.in cottony fibers. Frequency in New York City: Rare (NYS S1, T). A colony of one individual. Habitat: Open margins of swamp forest or marsh edges, soil pH 4.6-5.9 (USDA, NRCS 2010). Intolerant of shade.